Start the quiz fresh every time. Start where they left off the last time they visited the quiz. Choose (via a prompt) whether to start over or resume where they left off. To customize the resume behavior, you'll need to open the Player Properties window (resume behavior is part of the player). 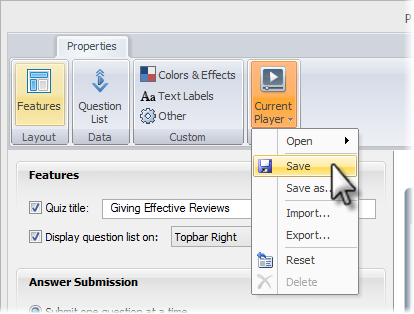 Go to the Home tab on the Quizmaker ribbon, and click Player. Always resume: This causes your quiz to automatically open at the place where the learner left off last time. Users won't see a prompt; the resume just happens automatically. Never resume: This causes your quiz to always open at the beginning, regardless of whether the learner completed part of the quiz previously. Users won't see a prompt. If you've enabled a resume prompt, you can customize what it says. The text comes from your player's Text Labels. If you need help editing the text labels, see this tutorial. To save your player, click the Current Player button on the Player Properties ribbon and choose Save. Enter a name for the player if you're prompted, and click OK.